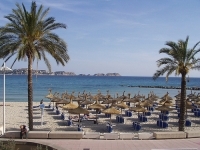 Paguera has been a favoured Mallorcan tourist resort since the 1960s and is immensely popular with European visitors, particularly from Germany. Although not as frenetic as nearby Magalluf and Palma Nova, and slightly more upmarket, it is still a noisy and bustling resort - not one to visit if seeking peace and tranquillity. Paguera is situated on the southwest coast of the island and boasts three principal beaches that are popular with holidaymakers (Playa Palmira, Playa Tora and Playa La Romana) and are linked by a pedestrian promenade. This Spanish resort town offers a number of activities to enjoy during the day, as well as a lively nightlife, although many choose to simply enjoy the entertainment offered by their hotels. There are also regular buses to the ever-popular, even busier Magaluf and other neighbouring towns and resorts. Many visitors come to enjoy the web of coastal hiking routes, while others prefer to just laze on the beach and enjoy the sunshine and warm waters. Paguera features El Bulevar Street, which is a long stretch of shops behind the pedestrian promenade where holidaymakers and shoppers can splurge on designer clothes, jewellery, leather goods and other Spanish holiday souvenirs. Be sure to explore the boutiques and smaller shops in the side streets along El Bulevar. There is also a lovely market at nearby Andraitx on Wednesday mornings that is worth exploring. In Paguera, the top-rated restaurants for holidaymakers include La Grita, Casa Rustica and La Gran Tortuga. The resort offers a number of different restaurants with a variety of fare; many cater for the German palette, though some offer local dishes and excellent Spanish seafood. There are also various sidewalk cafes and bistros along the promenade. Paguera has a good range of bars, and although many cater to German holidaymakers, there are British style pubs available too. There are some low-key discos, a number of live music venues and a few nightclubs, but although it is a lively resort Paguera's nightlife pales in comparison to the neighbouring resorts of Magaluf and Palma Nova. These party resorts are only a hop and a skip away though, so those in search of fun after dark shouldn't struggle to find it. There are plenty of activities in Paguera to amuse those holidaymakers tired of lazing by the pool or on the beach. Water sports are on offer, as well as a small water park, plenty of nearby golf courses, and excellent walking and hiking. An interesting short boat trip to the Dragonera Natural Park on the small Dragonera Island can be arranged. The conservation area has a small museum, as well as Roman ruins. Glass-bottomed boat trips are also popular. Paguera can get highly congested and parking space is limited. Many of the hotels are up on the hills behind the town centre, which can pose a problem for those with disabilities, the elderly and parents with pushchairs.